[—] Book 9 is Here! I HAVE BOOK 19 IN MY HANDS, ALL 218 PAGES OF IT! I've already begun sending books to eligible Level 4, 5, and 6 Defenders20+. As soon as they're all taken care of I'll reopen the store with supplies I have left. Gimme a week or two? Still moving through molasses these days. Also, at that time, we'll start selling them at IndyPlanet too, as usual. "As usual". That's the last thing I'd use to describe Book 19. 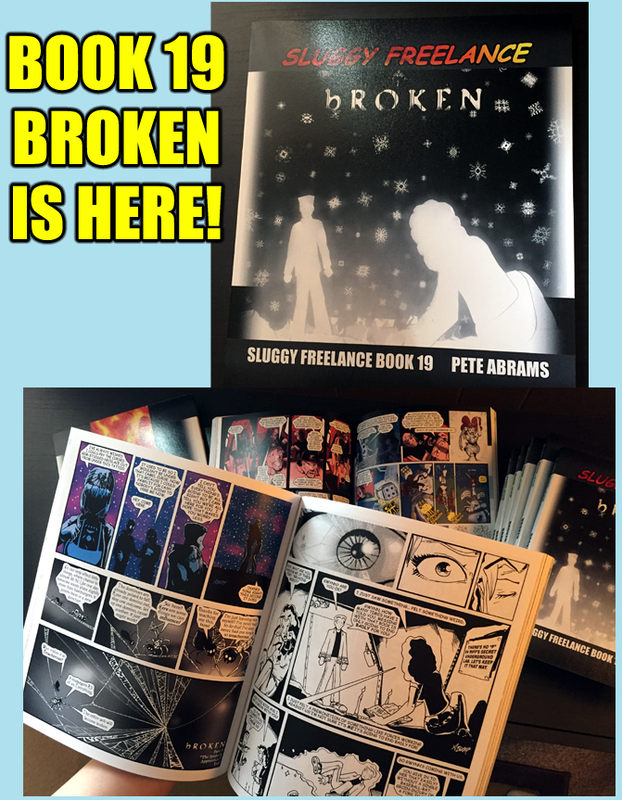 Sluggy Freelance Book 19 BROKEN is one of my favorite books yet. It's as dark as anything I've ever written. No, it is the darkest thing I've ever written. But it's beautiful. The colors, the layouts, everything. The silly unassuming nine page bonus story that occurs early in the book "Revelation of the Scyllakracken" hides a deeper understanding and foreshadowing of later events in the book. It was the hardest task in putting this book together, finding a bonus story that 'fit' the tone of the book overall. Achievement Unlocked! I'm very proud of every aspect of this book. I hope you will get this in your hand, find a cozy corner, and immerse yourself once again in the pain and darkness. Also the Bun-bun vs. Oasis knife-fight. Check this out! 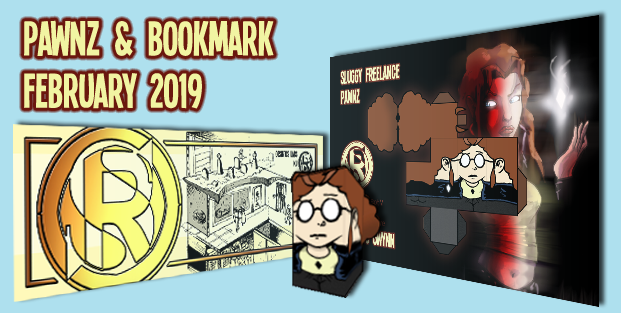 Here's the next round of Sluggy Freelance Defenders20+ Exclusive Pawnz and Bookmarks of the Month(s)! All Book 19 themed! Reminder: I'm distributing them digitally and physically bi-monthly so February and March collectibles will go out mid-April. NIFTY! The new Defenders20+ system has literally saved Sluggy Freelance, and I know what literally means. Almost a year and a half ago, I was going to retire because I couldn’t keep up with the stress and workload. My site had become stagnant and I lacked the capability to make the most mundane changes. I simply couldn’t do things the way I had been doing them anymore, period. The end. The D20+ system changed everything! I know it may have been a hard transition for you all going from a new strip every day (even if many of them were rushed, filler or vacation weeks) to around 12 solid strips a month, but it’s made such a positive difference in my life. When tragedy struck my family I was able to travel where I needed to be at a moment’s notice and stay as long as was required WITHOUT the stressful unforgiving relentless drive that had me doing daily comics for twenty years. Peace to grieve. Peace to connect. That is some rock-solid benefits the new system has made for me and my family. SO A HEARTFELT THANKYOU DEFENDERS20+ FROM MY WHOLE FAMILY!!! Here’s where I'll spend a moment to keep this free comic safe, because we honestly need new Defenders to have this continue working. If you’ve been reading this strip for a few years and haven’t supported much in the past, would you consider becoming a Defender 20+? 50 cents a strip, 12 strips max a month, $6 a month! The price of one fast-food lunch for a MONTH of comics! JOIN NOW and KEEP SLUGGY STRONG THROUGH 2019 AND BEYOND! Just consider it for a moment and you get a thumbs-up from me for time well spent. The End of Hereti-Corp is rather significant to me and worth sharing. As “The Heavens and the Earth” chapter draw to a close it marks a significant moment in Sluggy Freelance history. I know I’ve mentioned this in convention-talks, not sure if I posted it here, but just about every story and event in the history of the comic has fallen along one of two roads. The end of the current chapter marks the “end of the line” for one of those roads. Thanks for taking the journey past this milestone with me! I look forward to the next story being a little smaller in scope! I bet you do too. That was a long day! Might be one for the record books if there is such a webcomics thing! Have a great holiday season and enjoy ringing in the new year with loved ones, I know I will! And I’ll see you all in January. One last thing. Be kind to each other. This is not a catch-phrase. “Kindness” is a great meaningful word. We tend to judge others by a spectrum of criteria that don’t matter as much as whether something or someone is coming from a place of kindness or cruelty. Be that kind person, and look for the kindness in others. You’ll see, it’s be like being fluxed to a better world. CHEERS! [+] Here's whats coming up! Hey all! I've been stuck under Book 19 for a while, trying to solve an puzzle that at times seemed unsolvable! Now that I've pinned it down, the rest of the schedule falls into place! BOOK 19 WILL BE PERFECT, AND WILL BE OFF TO THE PRINTER BY JANUARY! 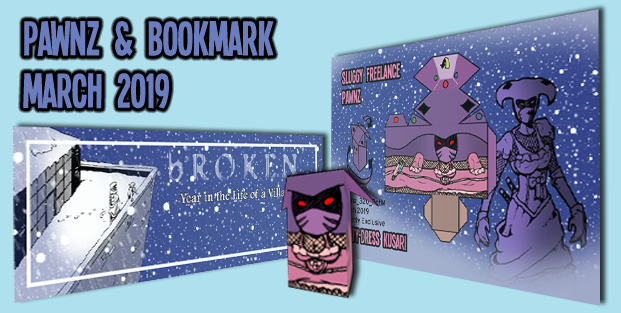 Book 19, "BROKEN", is a very important book for me to do right. And because of the tone of the book, and the dark ending, creating a fitting bonus story of a proper tone proved almost insurmountable. But I found it at last! The bonus story will appear mid-book, between archive chapters 58 and 59 respectively. On the surface it's a fun little stand-alone story. But its also going to be doing so much heavy lifting on a whole other level. If I do this right it might be my favorite Sluggy book bonus story of all time! Its a great euphoric feeling, looking past a wastepaper basket filed with crumpled up concepts, to find the one concept that's not just passable, but perfect! Yeah, I almost danced. To keep me book-focused, I'm going to limit myself to a maximum of two comics a week, or less, until Book 19 is off to the printers! THE SLUGGY STORE WILL OPEN BLACK FRIDAY! OK that was easier than I thought! 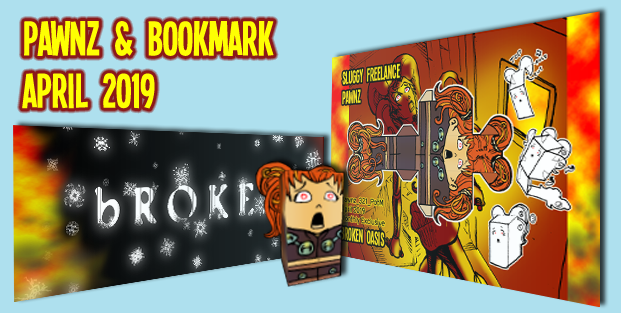 I haven't designed the bookmarks yet, but I've got pawnz and themes! Fittingly we're capping off 2018 with the man of the hour. Farewell, Dr. Schlock! And I've been meaning to do a Pawnz of Aylee's near-human current form, so that's what I chose to open 2019 with!